Exposed by the 1990 fire that destroyed the Chipman-Peterson building, the full-height John Hodnett Hardware Store sign is seen for the first time in ninety-two years. One of the most fundamental things people notice in downtown Tempe these days is how fast things are changing ─ high density development producing skyscrapers (a new word for Tempe) that tower over the one, two and three story buildings that have traditionally defined downtown’s modest skyline. Like virtually every other city Tempe during its fragile gas-lit era unfortunately saw too many fires consuming vulnerable wooden structures. One of the first major blazes occurred in 1894 when the wooden Tempe Hotel ─ on the present-day site of the Casa Loma building at Third Street and Mill ─ was entirely destroyed by flames. The first Andre Building just across the street from the Casa Loma was another victim. Erected in 1888, it was felled by fire in 1899. R.G. Andre replaced it with a more substantial brick structure a year later. Two modern-day restaurant fires have since challenged the Andre’s durability. Although a bit battle-scarred the building still stands as an elegant reminder of an earlier Tempe. Charles Trumble Hayden’s first adobe flour mill completed in 1874 was ravage by flames in 1917. It was succeeded by a virtually indestructible cast-in-place concrete building that was tested by an avoidable vagrant-started, stubborn, three-alarm fire October 1, 2002. Suffering little structural damage, the old concrete Mill proved its resilience. Modern-day firefighting technology has been responsible for saving several downtown historic buildings that might have otherwise been lost. The Tempe Hardware Building, Maricopa County’s oldest three-story structure, completed in 1898, stood proudly for 79 years before almost being lost by a nearly-disastrous conflagration in 1976. The Chipman – Peterson Building wasn’t quite as fortunate, however. Completed in 1898, the building changed its appearance over time. It underwent a complete renovation in 1983 ─ not enough though to save it from an inferno seven years later. It succumbed to a late-night restaurant grease-fire December 27, 1990. The Vienna Bakery building, its neighbor to the south heavily damaged by the flames and water ─ survived to become the present-day home of Restaurant Mexico. The building takes its modern name from the structure’s longest–running tenant the Vienna Bakery which occupied the 1800 square foot space from 1904 to 1963. Local businessman and political leader John S. Armstrong completed the building in 1893, five years before Neils Peterson erected his structure to the north. Fire is never a good thing. But the Chipman-Peterson loss surprisingly revealed an intact intriguing piece of Tempe history that had not been seen since 1898! 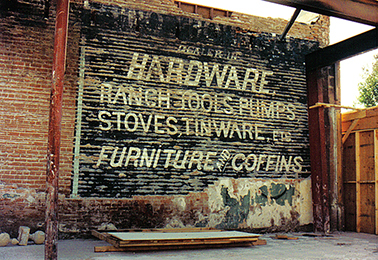 It was a building-height hand-painted sign on the north wall of the Vienna Bakery advertising “Jhn Hodnett Dealer in Hardware, Ranch Tools, Pumps, Stoves, Tinware, etc. Furniture and Coffins” ─ everything needed for life (and death) in a small Arizona town. John J. Hodnett is a bit of a Tempe mystery. We know he opened his hardware business in 1896 in Armstrong’s building after the first tenant T.F. Hudson’s Drugstore moved out. As was the case in many rural towns, citizens often held several titles. Hodnett was appointed postmaster in 1897 allowing him to also add for the next three years a post-office to the numerous services of his business. For the few who got a chance to see it, the wonderful Hodnett sign gave an albeit ever so brief glimpse into an early Tempe enterprise. When the Chipman-Peterson replacement was completed in 1991 the old Hodnett sign was once again sadly covered over never to be seen again. 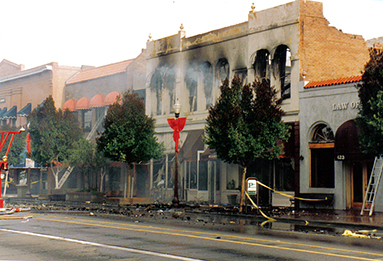 The aftermath of the December 27, 1990 fire that entire destroyed the 1898 Chipman-Peterson Building.